The Radlex Steering Committee identified three pillars of need for controlled terminology. “Say what you mean and mean what you say” is not a phrase one may automatically associate with radiology, but terminology—especially standardized terminology—is increasingly important to the radiology practice, as is the benefit it generates in accompanying radiologic images in a structured report. Images have always been considered the crux of the message between radiologists and referring physicians. But what many radiologists are discovering is that images without a unified, structured language to describe their findings leaves room for both confusion and improvement in radiology reports. Curtis Langlotz, MD, PhD, vice chair for informatics in the radiology department at the University of Pennsylvania Health System in Philadelphia, co-led a workshop at the July 2007 American College of Radiology (ACR) Intersociety Conference on structured reporting and has seen an increased awareness of the issue since then. “There actually was consensus of opinion that structured reporting is the best way to go, provided radiologists have tools to do so as quickly as the reporting process is currently being completed,” he says. In light of the increasing interest in this area, the Radiological Society of North America (RSNA) established the Structured Reporting Subcommittee and convened a workshop that brought together radiologists and informatics experts regarding how to move forward with establishing a standardized reporting language and templates. RSNA invited interested members to discuss the topic and learn what other specialties such as cardiology and pathology have done concerning structured reporting. The ACR presented information on the Breast Imaging Reporting and Data System structured reporting tool. “We’re aiming to learn what has been done before in other areas and think about ways to do it for radiology,” says Langlotz. “There was great involvement from many radiologists interested in helping develop reporting templates,” says Charles E. Kahn, Jr, MD, MS, chief of radiology informatics at the Medical College of Wisconsin, who cochairs RSNA’s committee. “The committee is looking to create a mechanism by which other sub-specialty groups can create reporting templates containing standard key elements that go into reports.” They are also examining technical issues such as how to best store and transmit the standardized information. Langlotz says there is recognition that radiology practices seeking to move toward structured reporting need help, and for radiology groups that want to start doing this, it serves as a guide for vendors to create this kind of report. 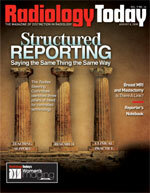 The structured reporting initiative helps give radiologists a starting point. “We’re saying, ‘You may want to try this; here’s a general template to help,’” says Langlotz. Kahn believes reporting is a critical area when looking to address the organizational and technological needs of radiology practices and that addressing the language and reporting best practices aspects are key to improvement. There are several advantages to structured reporting, Kahn says, foremost being the use of uniform language to talk about findings. In moving toward this goal, he sees the value of radiology practices linking with RadLex, what RSNA calls its “lexicon for uniform indexing and retrieval of radiology information resources.” The RadLex project is a collaboration with other radiology organizations, including the ACR and numerous physicians, to develop a comprehensive radiology lexicon. Radiologists currently use a variety of terminologies and standards, but no single lexicon serves all their needs. RadLex offers a single unified source of radiology terms designed to fill this need. To illustrate, two physicians may use the terms kidney stone and renal calculus in their respective reports, both meaning the same thing but not being uniform in language because there is no standardized, preferred term. So when a referring physician is searching for information, if he uses a different term than what is in the report, he may not always find the data he’s looking for and vice versa with the radiologist. Daniel L. Rubin, MD, MS, a clinical assistant professor of radiology at Stanford University and chairman of the RadLex Steering Committee, describes RadLex as a core infrastructure to various applications for radiologists, one of which is structured reporting. “Language is a core component in communicating radiologic information. It’s not all about images but [it’s also] the language that goes with them. It’s used in more than just radiology reports—for journal articles, textbooks, education, and Web-based applications. There are many ways of saying the same thing,” says Rubin. RSNA recognized this need and wanted to help establish standardized terminology to address it. Thus, the organization established the RadLex Steering Committee to create this terminology for the radiology community. The RadLex lexicon is freely available on the Web (http://radlex.org). Rubin likens controlled terminology to plumbing, where the end user doesn’t necessarily always think about the pipes and systems behind the scenes and only focuses on the water available at the tap when its needed. RadLex can be used unobtrusively with computer applications with the end user unaware that RadLex is in the loop but still gaining the benefit of the controlled terminology. Another aspect of RadLex will be the ability to encode best-practice templates that could provide the radiologists with suggestions about what should be in a complete report. According to Rubin, this could be added in a way that is unobtrusive to radiologists. The application could give feedback to dictating radiologists to confirm all the key components are provided in the report in a standardized way. RSNA must first define these best practices in reporting and, as soon as it does, Rubin believes vendors will want to pick it up, as they are already showing interest in RadLex, and see the benefit of making intelligent feedback during reporting available to their customers to improve the quality of care. “The technology is here, and we can do it. What will drive its adoption is radiologists agreeing that this is important,” Rubin says. The introduction of standardized reporting using RadLex will need to be highly sensitive to workflow issues. “We want to add functionality that RadLex can provide without thwarting productivity. In the implementations we are beginning to see, you only see enhanced functionality through things like intelligent menus and not cumbersome lists, look-up tables, or things that could interrupt the radiologists’ workflow,” says Rubin. He observes that the radiology community is currently focused on images and less on terminology, information retrieval, and data mining. But these IT components are also important elements of what represents the future of imaging informatics. The library of best-practice reports will aim to ensure that all the correct information is in the report in a consistent manner. The idea is that the person who is extracting the information from the report will know where to look for information and will consistently find it in the same place. “Typical voice recognition technology converts sounds of voice to text, and clearly there is a role for that, but with standardized reporting, the user will have the ability to make choices from a predefined library. But standardized reporting will not gain acceptance if it is not able to be performed as quickly as reporting is done now,” Langlotz says. Beyond simply generating standardized reports, having a uniform vocabulary could also set the stage for taking all the report information and linking it for applications such as quality assurance efforts, education, and examination findings, which would link to decision support in the same manner as is done now for mammography. “It makes information more transparent. It doesn’t restrict the radiologist because it provides the ability to augment their decision making by incorporating structured findings,” says Kahn. The goal for moving toward structured reporting is to reengineer the reporting process to help radiologists interact more effectively with referring physicians. “For example, if there is a critical result, you must make sure the findings are communicated and that the communication is documented,” says Kahn. Structured reporting is also vital in research studies. “Even with information as simple as lesion measurements, you want information not just in the text of the report but in a database so that it becomes more useful to researchers. All observations that radiologists make can be used for research,” says Kahn. To deliver the technology and make it available to radiology practices, RSNA’s committee is looking to create an information model that will be an open source with open access and available so that vendors can use it. “It might use technology such as XML to make the report template portable and usable. From there, the vendor can take it and use it in a way that works with their technology, be it through voice recognition, pull-down menus, or point-and-click options,” says Kahn. Implementation would be based on the reporting system developer, but the report would be transmitted in a standardized approach and formatted in a standardized manner. Langlotz believes such a system will offer tremendous benefits to the referring physician who has to extract the data from the report. “Structured reporting provides the ability to data mine, perform clinical research, and provide feedback to the radiologists at a [workflow] rate they are used to,” Langlotz says. What do other radiologists think about it? “There is very broad interest within radiology. A large number of radiologists see the positive benefits in terms of clinical practice, quality improvement, and radiology research,” says Kahn.